Who'd know, that conscious and adult people could be hooked by gambling addiction. Serious games for seniors can be converted into the most serious addiction problem, because it's really hard to convince mature people that they are not right and their life style, which leads to the serious problems, is incorrect. Loneliness, boredom and just individual problems, which can happen in life of every adult person, really provoke different desperate decisions, provoking addiction symptoms. It is considered that gamblers of female gender tend to play such games, as slots more often, and thus they express their escapism, while men, who vice versa want to feel as valid members of society, are playing such games, as roulette or craps. At first, adults perceive gambling as a kind of luxurious entertainment that they seldom experience because of a full-time job and very brief weekends. Gambling is not an innocent amusement, during which people just relax and get pleasure. The strong and sharp feelings of heat and greed, which it evokes, can cause a wish to continue playing all the time. Statistics announces that one among 10 seniors usually have all the possibilities to become one of the addicted gamblers. The members of this age group just don't come to the casino in order to have a chat or great recreation, the greatest idea of luck is being generated in the brain of every senior person during gambling -it's like a check of destiny for them. The doctor of Psychology of Medical Centre in Nebraska indicates that all the sorts of entertainment for seniors, especially if they like it very much; tend to grow into some kind of addiction. Their life is too monotonous to resist those incredible feelings of freedom and luck. 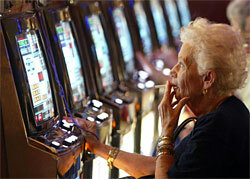 During the period from 1974 till 1994, the seniors' gamblers percentage grew for 30% (from 20% to 50%). The main factor is that adults are really obstinate and just refuse to hear and to acknowledge the fact of their guiltiness. If for the teenagers and just young people, it's quite possible to give childish explanations for serious outcomes of problem gambling, seniors just don't understand it. And the most horrible thing in the entire situation with adults' addiction is that their children suffer. And it's not the case, where one of the spouses just can abandon an addict and finish suffering. Here, children are powerless, and there are no people that could instruct the gamblers in more of the cases. Children face lots of risk to become the same and follow the mother's\father's example. Their child can have the highest psychological complications and an adjustment disorder, observing adult's addiction. Even such a serious syndrome as Oppositional Defiant Disorder can be provoked in the gambler's children (especially in boys). So, wind up all this nonsense and take care of your close people!